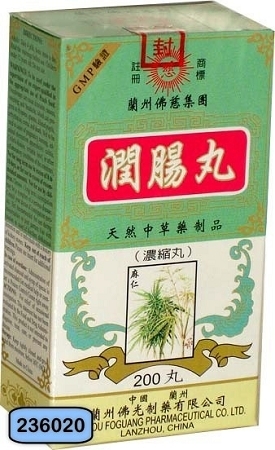 This Chinese herbal supplement helps you find relief from occasional constipation. For relief of occasional constipation. Warnings To be used under the supervision of an expert qualified in the appropriate use of Peach Seed. Overdosage can cause dizziness, nausea, vomiting, and headache, which can progress to dyspnea, spasms, dilated pupils, arrhythmias, coma, and death. Not to be used in cases of pregnancy, nursing, intestinal obstruction, appendicitis, colitis, Crohn's disease, irritable bowl, or other inflammatory conditions of the intestines. Not for long term use in excess of 8 to 10 days, or for use in excess of recommended amounts. Not for use by children. Chronic (long term) constipation may be a symptom of a serious disease. Consult your doctor if constipation persists.Not recommended for use during menstruation or post partum. Use with caution in cases of diarrhea, abdominal distention and in individuals with a history of kidney stones. Keep out of reach of children. Please see insert for additional warning. In case of overdose: Administration of activated charcoal and syrup of ipecac is recommended. Get medical help or contact a Poison Control Center right away.